My love of Chardonnay is out of fashion with current trends. I enjoy the more broader, oaky, style – especially if harmoniously balanced by acidity. This was a lovely example. From Stellenbosch in South Africa, it was a very clear, very pale green colour with some viscosity evident (it was 14% ABV). The nose was dominated by ripe melon fruit, a lemon/lime acidity and vanilla oak notes. A great wine to smell. The taste was a great balance of the citrus notes and creamy vanilla – without being over-oaked. There is a slight touch of sweet fruit at the finish whilst the grip stopped it being flabby. 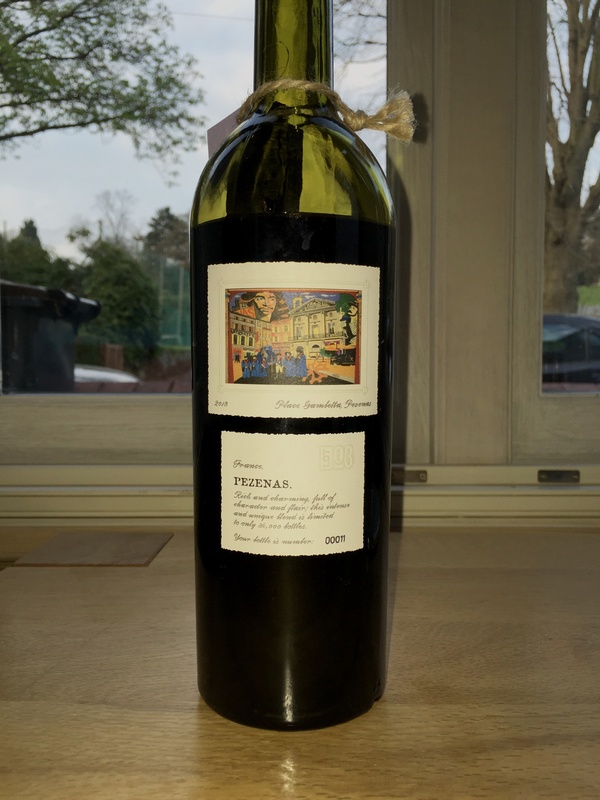 It’s a really well-made wine that gets good reviews on line; it’s available from Majestic Wines at £15.99. If you like the broader Chardonnay style it’s a wine worth trying. Richard and I play a game with Pinot Noir. He knows I can generally spot the grape but have difficulty with its origin – NZ or Burgundy. 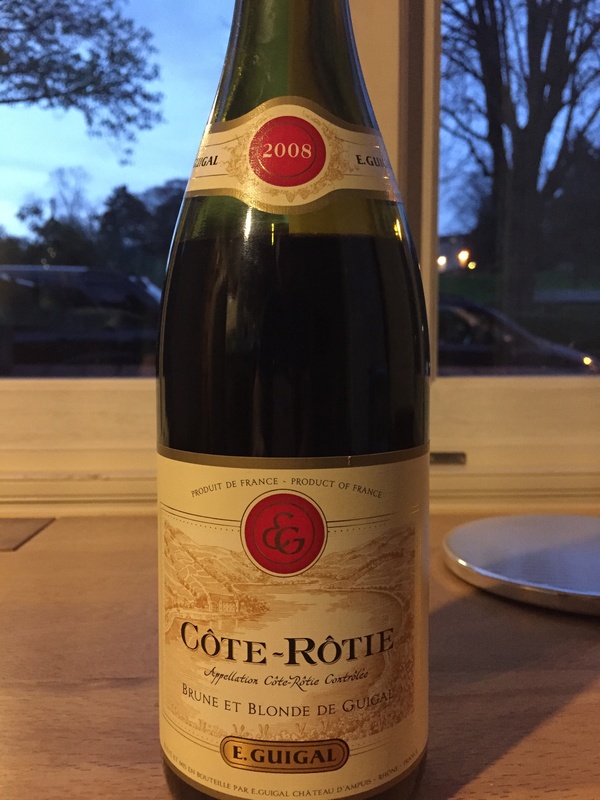 I have learned that the forward, lighter style is not likely to be northern Cote d’Or and the Cote de Beaune wines have more similarity to NZ – sometimes. However, last Sunday, I did claim NZ and was correct – which is not always the case. 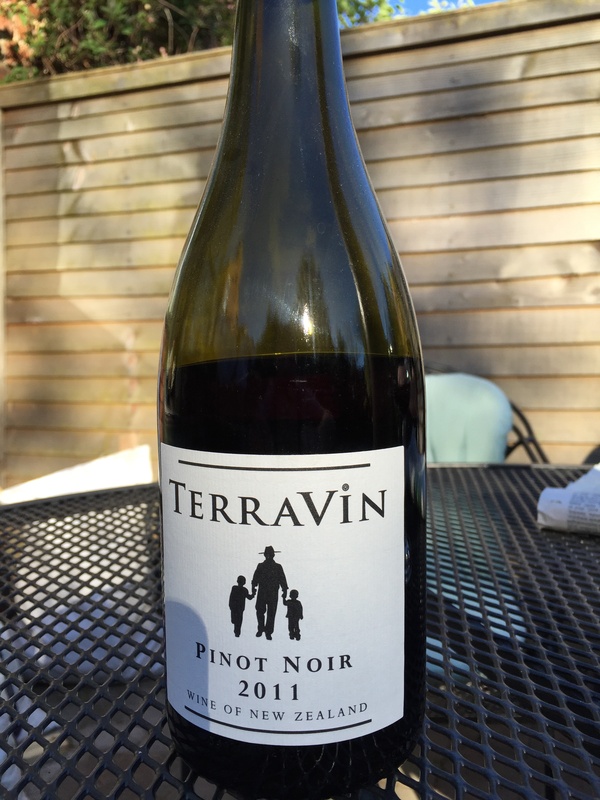 The wine was Terravin Pinot Noir from the WS, purchased on our recent excursion to Stevenage. The light red colour, slightly pink at the edges, was followed by a very appealing smokey nose, with acidity and forward fruit. It was an enjoyable wine to taste, all sweet red fruits but sappy and granitey. This made for a pure and clean palate rather than a rich one. At £20, it was on the expensive side but £20 spent in Burgundy is maybe more risky than this as regards quality. It’s a guaranteed attractive wine for this price, if lacking in complexity; great with lighter meats. For wines to age well they need to be well-balanced, to begin with, but also have high levels of two out of the three following components – tannins, sugar and acids. The better white wines of Alsace – notably Riesling, Pinot Gris and Gewürztraminer – have the latter two components in abundance, making last Sunday’s tasting a very pleasurable experience. 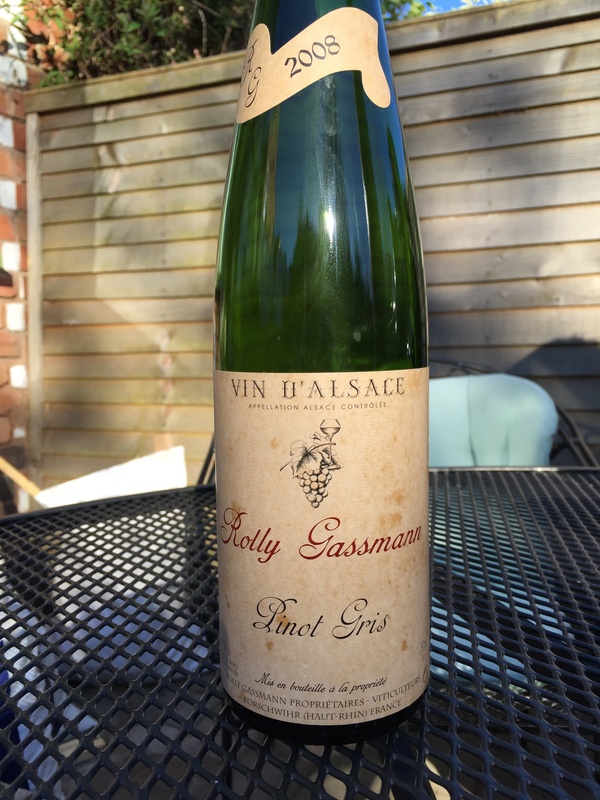 Rolly Gassmann’s Pinot Gris 2008 (13%) had been opened 24 hours and still was delightful under a warmish late-afternoon April sun. Immediately striking was the wine’s rich golden colour and its viscosity, promising a heavier wine. The grapey nose would have you believe it to be a muted Muscat, rich and exotic. The taste ran the tightrope balance of clean acidity and sweetness, really attractive and would be ideal for partnering a rich pate or Roquefort, as Richard suggested. Medium length, it could be labelled one-dimensional and yet it was still a pleasure to drink. The following night – 48 hours after opening – it was still going strong, and had developed a subtle lavender nose, which was even more interesting. Alsace wines, if your taste is for the older, developed flavours, are great value for money when compared with white Burgundy. First holiday to Greece coming up soon so we’ve been trying a few. See here and here. This was what is, increasingly, a rare WS purchase (£24). Still a great place to buy wine but I’m trying to run down my stock a bit (or a lot). But recently Geoff and I shared a mixed case of various Greek wines. Friday night with Angie so no notes taken. However Geoff has provided me with a link to the website for some information. 100% mavrotragano, not a grape I’m familiar with. Tasted to me rather like a sangiovese/gamay blend. Bright colour and fruit, quite spicy, very easy to drink and very moreish. Rather overpriced given the relative lack of complexity. All the Greek wines we have tasted so far have been upmarket so I’m wondering what I’ll find in our little fishing village with its very small supermarket. Blog to follow in June. One of my favourite red grapes is Cabernet Franc. It can produce some raspberry-perfumed (and perfumed is the right word) wines that are light with an attractive sappiness. It can also produce much weightier wines that have great longevity. On the Loire, it’s all down to the soils, evidently – sandy limestone for the weight whilst limestone and/or gravel for the lighter wines. When visiting Saumur in the Loire two years ago, I was offered a range of wines by a local producer. They were a mix of pure CF and CF/Cab Sauv. blends. I opted, every time, for the mono CFs. They had a cleanness of style that, for me, was lost when the jammier, richer CS was blended in. The grower was surprised but I wasn’t going to be rude and say that the blending made them too ‘keen to please’ for my liking. 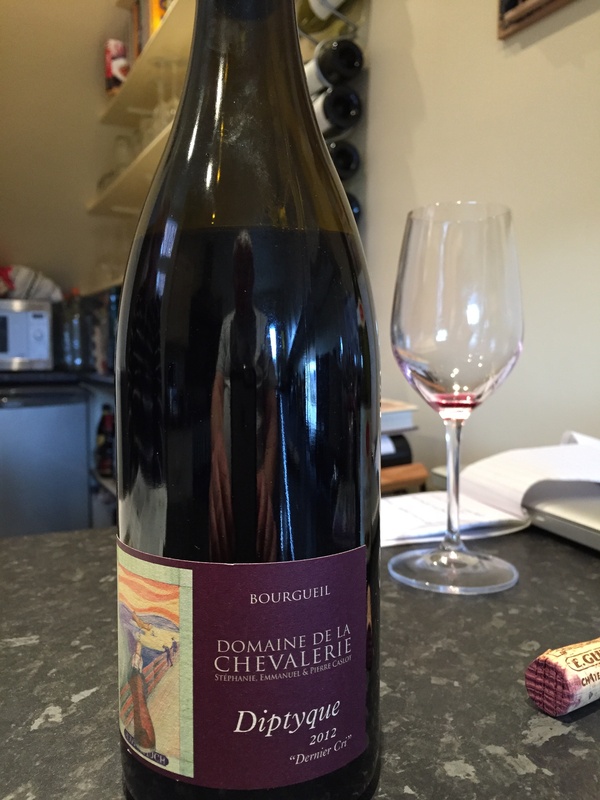 The 2012 Domaine de la Chevalerie, Diptyque, Dernier Cri, from the Caslot family, is 100% CF. It’s AC is Bourgueil on the Loire. Pink rimmed and bright red in the glass, it gave off a vanilla-nose and red fruit nose that is so attractive. There was also some attractive farmyard maturity present. The medium length palate had some refreshing acidity and a rich red-fruit style and power which suggested two more years drinking for this 12.5% wine. 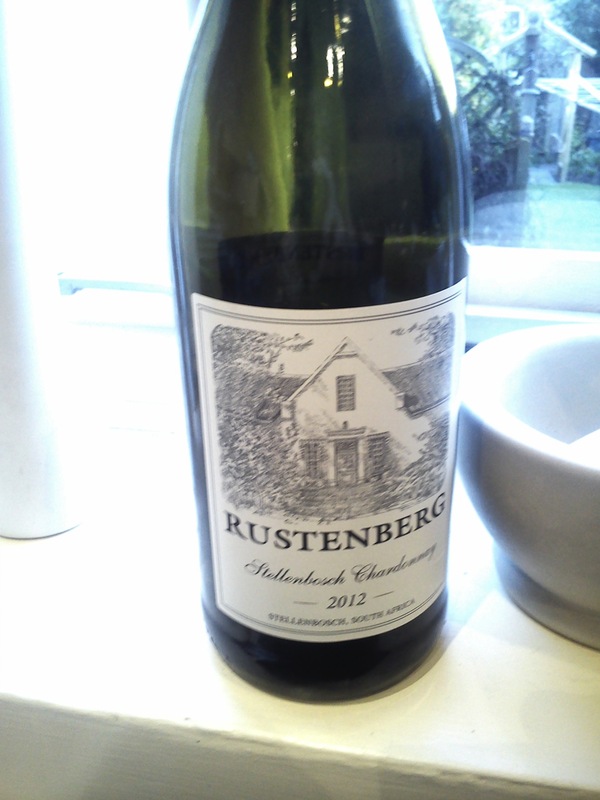 A lovely drop of wine for £10 and great accompaniment for lighter, simpler meals. This is an odd question posed by Richard when tasting Guigal’s Cote Rotie Brune et Blonde 2008. I think it’s a good question. The statistics have it that the average time between buying a bottle of wine and opening it is 120 minutes. Not long. Or rather, long enough to drive home, change, get food and sit down. Or grab a bottle and get to the party. There are lots of scenarios, I’m sure. This wine had been opened three days – we were trying the last two glasses on Sunday night. The black colour had a slight brick rim and quite noticeable windows. There was a slight hint of white pepper on the nose (Syrah dominant blend) but the main bouquet was of dark red fruits which later developed into lighter, almost strawberry notes. The flavour was full with smoothed out tannins and the sweet red fruits were coming through. A lovely glass of wine but too young to be at its best (and this was after three days). It was great to sip gently but would get so much better, as its restrained power suggested. So, to return to the question. Why sell it when it needs years to be at its best? If the two hour rule applies the buyer will drink a wine way before it’s ready to be really enjoyed. Perhaps it should come with a “Best After Date” on the label. Now, there’s an idea. Pity the marketing staff in the Aldi wine department. Finest (with its irritating asterisk) has been taken, as has Taste The Difference – not always a recommendation. Morrison has M Signature and Asda Extra Special. On the other hand Waitrose and Lidl don’t differentiate their fine wines into a separate range. so Aldi had a choice but went with Exquisite as the name for their up-market wines. An appropriate word for jewellery perhaps but not the first word that comes to my mind when describing an alcoholic drink. I happened to see the above wine when I was in Aldi looking for something else and the shelf tag does indeed say Exquisite. But this is actually a wine from the Lot Collection, meant to be ‘super premium’ – but only £9.99. Confused? Anyway this is Lot 3 from Pezenas, made by Mas, a big name in those parts. One of my favourite French towns as it happens. All the signifiers of a drink with fine wine pretensions are here. Heavy, numbered bottle, information tag tied with twine round the neck, painting on the label. This bottle is no.11 (out of 26,000), believe it or not. The wine is a typical GSM blend, possibly with carignan as well. A very nice drink, plenty of rich, spicy fruit, some acidity. No oak that I could taste [edit: the neck label states that the wine is matured in French and American oak] so I think the claim that it will develop for the next 10 years is fanciful. Good value and I’d buy it again.